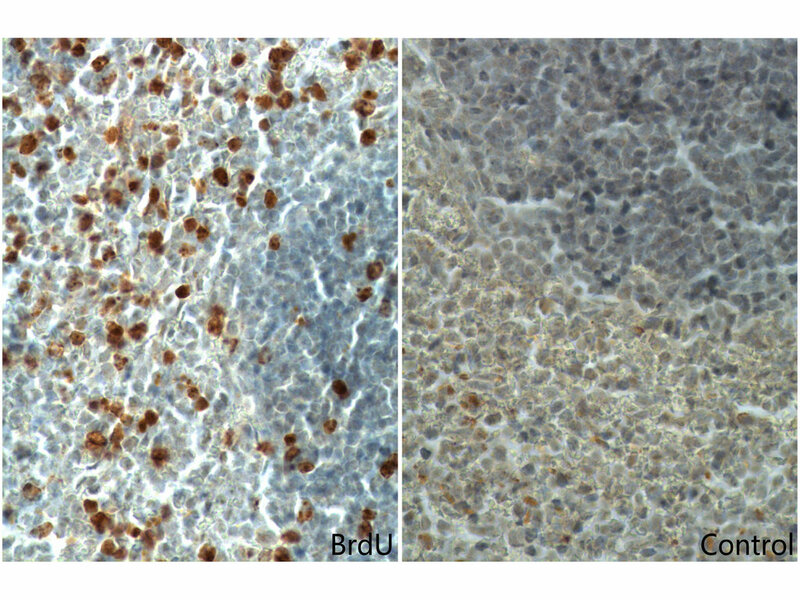 Immunohistochemistry of paraffin-embedded mouse spleen tissue slide (with/without BrdU feeding) using 66241-1-Ig( BrDu Antibody) at dilution of 1:400 (under 10x lens). Heat mediated antigen retrieved with Tris-EDTA buffer(pH9). Bromodeoxyuridine (5-bromo-2'-deoxyuridine, BrdU, BUdR, BrdUrd) is a synthetic nucleoside that is an analog of thymidine. It can be incorporated into the newly synthesized DNA of replicating cells (during the S phase of the cell cycle), substituting for thymidine during DNA replication. As such, BrdU is used for birth dating and monitoring cell proliferation. BrdU is a toxic and mutagenic substance. It triggers cell death, the formation of teratomas, alters DNA stability, lengthens the cell cycle, and has mitogenic, transcriptional and translational effects on cells that incorporate it. 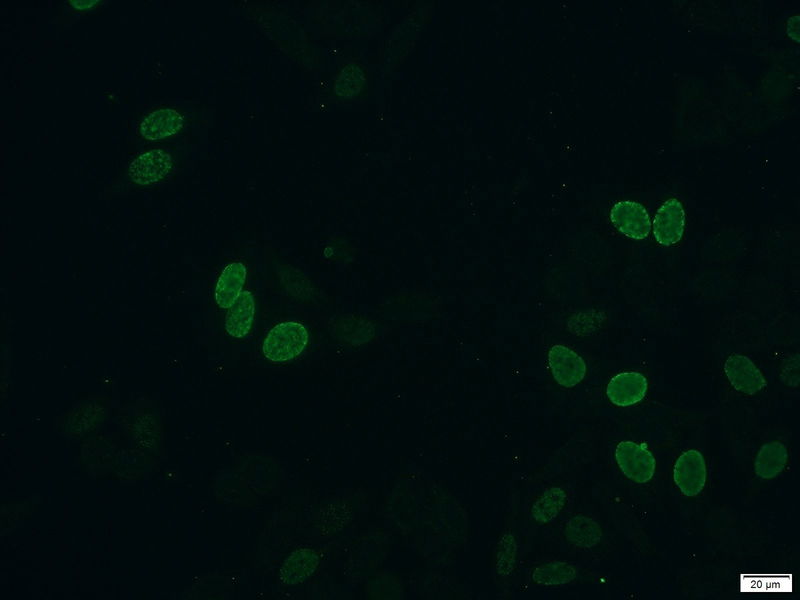 This antibody does not cross react with Thymidine. Quercetin reverses experimental pulmonary arterial hypertension by modulating the TrkA pathway. MAD ointment ameliorates Imiquimod-induced psoriasiform dermatitis by inhibiting the IL-23/IL-17 axis in mice. Hyaluronan synthase 2 expressed by cancer-associated fibroblasts promotes oral cancer invasion. 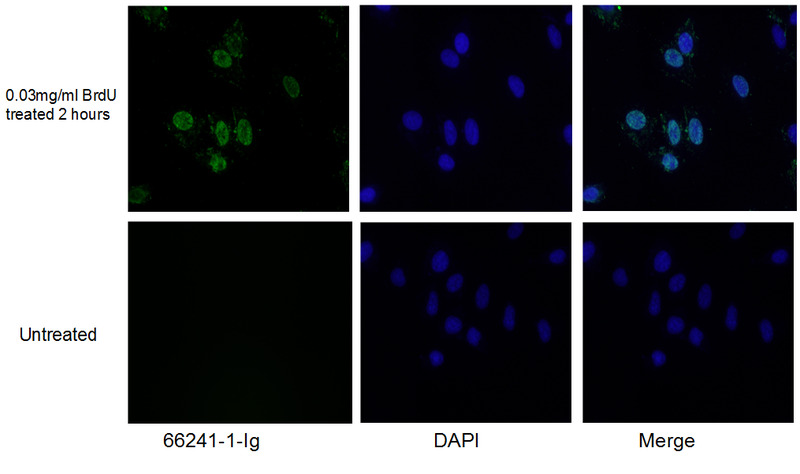 MicroRNA-99a inhibits insulin-induced proliferation, migration, dedifferentiation, and rapamycin resistance of vascular smooth muscle cells by inhibiting insulin-like growth factor-1 receptor and mammalian target of rapamycin. Oxidative stress affects retinal pigment epithelial cell survival through epidermal growth factor receptor/AKT signaling pathway. 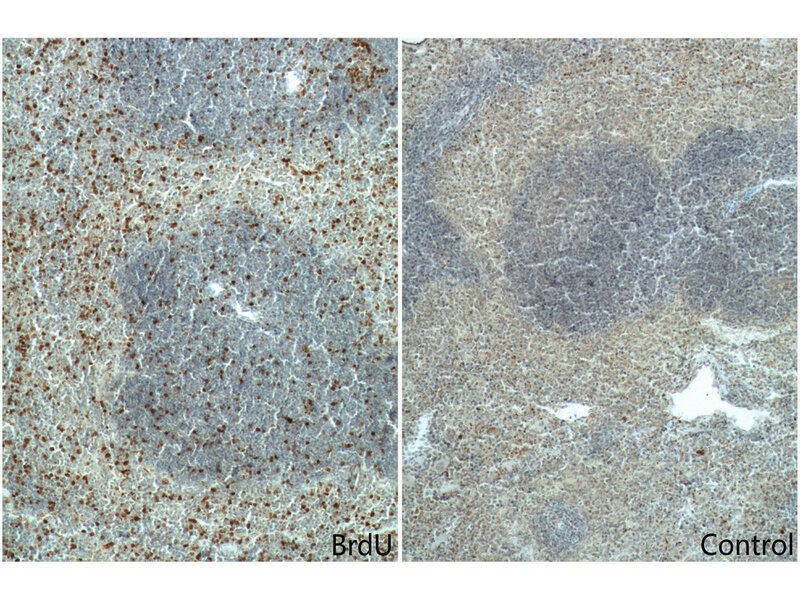 Immunohistochemistry of paraffin-embedded mouse spleen tissue (with/without BrdU feeding) slide using 66241-1-Ig( BrDu Antibody) at dilution of 1:400 (under 40x lens). Heat mediated antigen retrieved with Tris-EDTA buffer(pH9). Immunohistochemistry of paraffin-embedded mouse spleen tissue (with/without BrdU feeding) slide using 66241-1-Ig( BrDu Antibody) at dilution of 1:400 (under 10x lens). Heat mediated antigen retrieved with Tris-EDTA buffer(pH9).